The blue wood pattern in the background is from the DCWV Green Stack. After gluing this to the 3.5 x 2.5 piece, I rounded the bottom corners and attached it with eyelets. I won’t lie – it took a couple of tries to get those pockets just right and I had to just kind of trim the left and right edges with scissors to get the piece to fit right before I glued it down and added the eyelets. Last, I cut some 1/2 inch strips and made the belt by attaching eyelets on one end. I used a brown colored pencil to add some scuff marks and fake stitching to the edges. 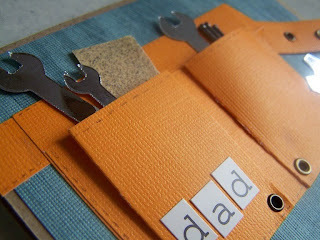 I also lined the inside of the card with some orange and white paper to make a nice writing surface. Here is a closeup of the pockets. 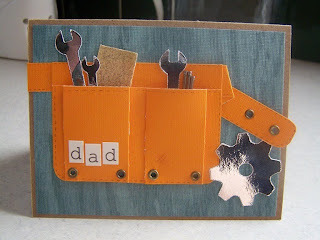 Aside from being a little tedious to make those pockets fit just right, this card was fun to make and I think it sure fits the “manly” category, don’t you? Special thanks to Nancy for sharing this card with us! If you have a card or technique you would like to share with us, please write me at kate@operationwritehome.org. Thanks for sharing--it is way cool! Thanks for this; I always need masculine card ideas! So adorable! Thanks for showing us how you did it, Nancy! Darling idea! I love your card and thanks for the template! This is so clever and cute!! Great card! I have the Indie Art cart on my Gypsy, but never noticed the wrenches. TFS! This is really cute! I love the shiny tools, too! This is sooo cute. Thank you so much for your tutorial. I wish my dad were still here so I could make it for him - he would get a kick out of it. My husband is not much of a handy man but maybe I will make one for him anyway. Wow! what an amazing paper sculpture!! Great fun. Thank you for sharing all the details with us.